National Hispanic Heritage Month is the period from September 15 to October 15 in the United States, when people recognize the contributions of Hispanic and Latino Americans to the group’s heritage and culture. I’m thrilled to start a new series on my blog showcasing notable Hispanics. 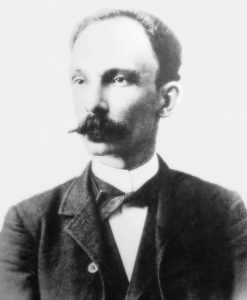 Today, I’m featuring José Martí, Cuba’s National Hero. He was also a gifted writer, journalist, and poet. Inspired by the Cuban revolt and uprising he wrote his first poem at the age of 15. He was born on January 28, 1853, in Havana, to a Spanish father, Mariano Martí Navarro, and Leonor Pérez Cabrera, a native of the Canary Islands. He was an advocate for independence and found guilty of treason. Shackled and incarcerated his mother pleaded for his release. The Spanish agreed but he was never to return to Cuba. Living in exile, he lived in many countries finally settling in New York. In New York, he found the freedom to express himself freely and fight for Cuba’s independence. Disclosure: I received this book for purposes of a review. All opinions are mine, and I only review books that I truly believe in. This post may contain affiliate links. If you make a purchase I will receive a small monetary compensation at no cost to you. Thank you! 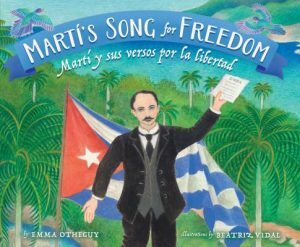 Marti’s Song for Freedom by author Emma Otheguy and illustrator Beatriz Vidal brings to life Marti’s life. This is a bilingual picture children’s book with thought-provoking and beautiful illustrations. With the turn of each page, you can read excerpts of his poems in both English and Spanish. 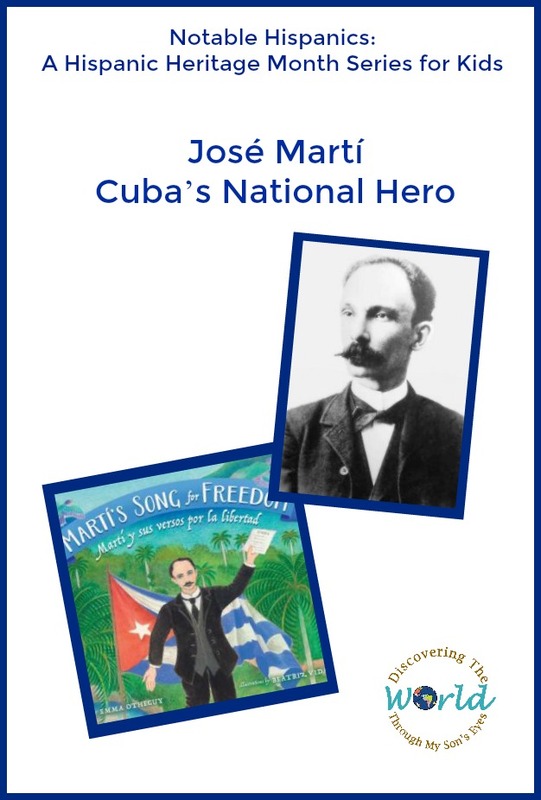 The full-page illustrations are eye-catching and ties into the storyline of Marti’s life: on his love for Cuba, his quest to end slavery and gain independence from Spain, to his imprisonment, and the harsh punishment and exile he had to face. In this picture book, you’ll also read his of love for the Catskill mountains in New York, and how he still felt a calling for Cuba. He later returned to Cuba to fight in the Ten Years’ War. At the end of the book, you’ll find an afterword, author’s note, and side by side poem excerpts in both English and Spanish. This is a great addition to any one’s homeschool or school library. A fun hands-on activity to enrich this book is to make a Cuban flag. After we read the book we looked up Cuba on the map, and made a pom-pom flag! The origin of the Cuban flag has two versions that you can read about here. This is an easy craft for kids of all ages. However, for little ones you’ll need to help cut the board out first. Once you’ve traced the lines have the kids glue the pom-poms on to the cardboard. Let dry, and voila! You have a Cuban flag! Emma Otheguy is a children’s book author and historian. For more information on her, you can visit her website here, or follow her on Twitter and on Facebook, too!